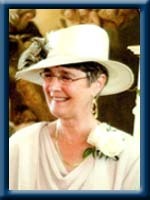 CLATTENBURG – Janice Christine “Jan”, 67, of Liverpool, passed away peacefully at home on Thursday, July 5th, 2012 surrounded by her loving family. Born in Dover, England, she was a daughter of the late Maxwell and Christina (Naylor) Low. Jan immigrated to Canada in 1966, eventually settling in Victoria, BC where she and former husband Eric raised Julie and Jamie. Jan moved to Liverpool in 1991 to marry David, whom she met through their shared love of figure skating. Jan had a life long passion for skating that started in Scotland where she was crowned Scottish Champion in 1963. She continued her involvement in the figure skating world after moving to Canada, from judging to administration to teaching. Jan was greatly respected for her commitment to the sport in both BC and Nova Scotia. Most recently, Jan was a key part of the Queens County Blades skating club where her passion and commitment will be sorely missed. Jan brought a joy and optimism to the club and took the greatest pleasure in helping kids gain confidence on their skates. Jan was eternally optimistic and graced those in her presence with her wit and compassion. Jan had a great sense of humour that she held onto right to the end. Jan’s strength of character left an impression on everyone she was close to. She was a dedicated and loving Nanny to her four grandchildren who brought a cherished spark to her life. An accomplished seamstress, Jan put those skills to creating countless skating and music festival costumes over the years, something she took great joy in. There is hardly anyone who learned to skate in Queens County over the last 20 years who hasn’t worn an outfit created by Jan. She will be dearly missed by her family and by the many friends she leaves behind in Nova Scotia and across the country. Jan is survived by her loving husband and best friend David; daughter Julie Bonham Kuntze (Johann) and their daughter Kyla; son Jamie Bonham (Seanna). ; step daughter Heidi (Dave) Sparkes and their son Eli; step son Dave Clattenburg and his children Keiran and Lochlan; and her brother Kenneth (Kate) Low of Pierrefonds, France. To David and all members of Jan’s family we express our deepest sympathies at this sad time. In her years here in Queens, Jan offered a lifetime’s worth of value to our community with her deep love of figure skating, the music festival and more. May the many happy memories you have of Jan help fill some of the great void her loss creates. We will be thinking of you in the days ahead. David and family: We were sorry to hear about Janice. Our thoughts and our prayers are with your family. Very sorry to hear of Jan’s passing. My thoughts and prayers are with you all in your time of sorrow. We are so sorry to hear of Jan’s passing. Our thoughts and prayers are with you. David & Family we are so sorry to hear of Jan passing, our prayers & thoughts are with you. My deepest sympathy to the family and community. Jan was someone that put her heart and sole in to everything and will be deeply missed by everyone in the community. It makes me smile to know that she was able to realize her dream of having QCB host provincials this past season. David and Family, you are in my thoughts and prayers. We are very sorry to see of Jan’s passing, so much to give to others and so young to have been taken away for sure. Prayers are sent to the family. David so sorry to hear of the loss of your loved one,take care! David and family….so very sorry to hear of Jan’s passing. May you find comfort and strength from those loved ones who surround you during this difficult time. Jan will be missed by many. David and family, so sorry to hear of your loss. You are in our thoughts and hope that knowing that others care helps to get you through this sad time. David I am so shocked, I did not know that Jan was Sick. What a Great Lady she was. I’m so sorry for your Loss. My Prayers and Thoughts are with you all at this most difficult time. May Jan now Rest in Peace for God has received a most precious Angel. Our sincere sympathy to you and your family on the loss of Jan. We trust that her memories will somehow replace her absence and you will be comforted in knowing that other share your loss. I just heard about your wife the other day and we are deeply sorrowed for the loss that you and your family are experiencing. May God give you and yours the strength you will need to get through this awful experience. When things are calm and quiet you will be able to experience the happy memories you will always carry with you. There are no words to express how i feel about your loss,please know that my prayers are with you at this very difficult time. David – So sorry to read of Jan’s passing. She will certainly be missed in the figure skating world. I have a lot of good memories from skating competitions with both you and Jan . Take care and know that a lot of people have you in their thoughts. David, my deepest sympathy on Jan’s passing. We shared so many wonderful times during our “careers” as skating judges – a lot of laughs, fun & wonderful memories. Especially that one unbelievable snowbound trip to Newfoundland with, literally, 18 foot snowbanks!! If someone will email me an address I will gladly make a donation to the Queens County Blades Skating Club. Memories are our greatest legacy. It is with a heavy hearts our family sends off these condolences for the tragic loss you are experiencing. We wish to pass on to you that we feel so proud and honoured for our daughter Kennedy to have had the privilege of being coached and educated by Jan, through the QCB program. Her joy and enthusiasm for skating and the children was beyond contagious and made for quick wit and laughter (hopefully not just for the parents) even through her students bumps and discouragements. Thank you Jan for the contributions you have made throughout the community over many years and the numerous costumes we have collected will be treasured always and a touchstone for many fond memories of an extrordinary soul. Heidi and Keiran you too are both blessed with the success and love of skating and I am sure the ice will become even more a source of inspiration than times past. It will be a pleasure to have a skate in her memory! So sorry to hear of Jan’s passing. My thoughts & prayers are with you all at this sad time. Take comfort in God’s presence surrounding you all as you mourn. Our deepest sympathy David to you and your family. So sorry for your loss. On behalf of the membership of the Shelburne Co. Figure Skating Club I extend my deepest sympathies for your loss. We are sorry to hear of your loss and know she will be thought of and missed by her family and many friends.Our hearts are with you. Please except my sincere sympathy for the loss of your wife and best friend. I did not know her but have experienced that desolate feeling of loss with the passing of my Dad. My prayers are with you. On behalf of myself and the Truro Skating Club, it is a very sad day to hear of the loss of Jan. She did so much for figure skating in Nova Scotia. So sorry for your loss. We are sorry to hear of the passing of Jan, She was a lovely lady and put so much into her family.Kieran was so blessed to have you and Jan into her life.She put alot of time into Kierans skating,and it showed as she is a beautiful skater.The community will miss her for all the costumes she made for the skating shows.It was unbelieveable the time she gave.Sending our condolences to you Dave her children Julie,Jamie,Heidi,and Dave.To the grandchildren she loved dearly, Remember the good memories as she will be sadly missed. Our deepest sympathy to you all. Many people share in your loss and have you in their thoughts and prayers. Jan will be missed forever. Take care of each other. Our deepest sympathy to each of you, It is not easy to loose someone you love. Our thought’s and prayer’s are with you all. We were so shocked and saddened to read of Jan’s passing. Years ago we had just moved into our home in Oak Bay when a knock came to the door. There was Jan with a plate of cookies welcoming us to the neighborhood. What thoughtfulness. She taught me how to sew figure skating costumes and encouraged our daughters to try skating. Although our daughters didn’t continue skating we all have taken an interest in competition due to Jan’s love of the sport. We send our deepest sympathies to you and to your family on your loss. I am deeply saddened to hear of Jan’s psassing. She was such an inspiration to all the skating community- always ready to help any skaters with her wisdom, as well as providing her expertise to the judging ranks. QCB will not be the same. My thoughts are with you at this time. I was very sad to read that your Mom passed away. I worked with Jan at Westcoast Savings Credit Union. She was full of life – she always had a smile. I will always remember the “granny hats” and skirts she made for us to wear during the Oak Bay Tea Party and for Christmas. She was truly one of a kind. My thoughts are with you and your family. Julie, so sorry to hear about your Mom. I have wonderful memories of times spent at your house getting fitted and poked for a dress!!! She did beautiful bead work and will always be remembered for her attention to detail. Take care, my best to your brother Jamie. I am so sorry to hear of Jan’s passing. We shared good times together in the skating club and I always enjoyed our chats since then. Take good care. Although we did not know Jan, it looks as if she was a wonderful person and did so much for the community. We are thinking of you at this most difficult time and our thoughts and prayers are with you in the trying days ahead. We’d like to extend our deepest sympathy in the loss of your wife and mother, Jan. We got to know Jan well through the skating club and it was always evident that her heart and soul were dedicated to the club with her strong leadership and full support of it in every way. Let the great memories you have as a family of Jan, help you through this difficult time. We are so sorry to hear of your recent loss. Take care of one another. Our thoughts are with you. Our heartfelt sympathy on your loss. Jan was a very warm, caring person and it was a privilege for us to have known her. We hope that you will take solice in the fact that her spirit of giving will continue through the persons she touched during her years as mentor and friend in the figure skating community and elsewhere. We will be thinking of you all in this time of sorrow. David & family, I’m so sorry for your loss. We met Jan when our daughter joined the QQB family and I served on the board with Jan. She was a wonderful woman who could always put a smile on your face. Nobody would understand the work she put in to QQB unless they saw it, I was amazed at how much she did, all the costumes for the closing, it was truly a task she took on with love. I’m so glad we had the chance to meet Jan, she will live on in the memories of her family and may boys and girls in our county. Sending all my love and prayers to get you through the tough times, keep her memory close. I am so sorry to hear of Jan’s passing. I am an acquaintance of Jan’s through Curves in Liverpool. A very beautiful, helpful and friendly lady who I will miss dearly. Please know my thoughts and prayers are with you and your family at this difficult time. I was so sorry to hear of Jan’s passing. My condolences to Julie and Jamie at this difficult time. I have such good memories of working with Jan at the conception of the Oak Bay Figure Skating Club in 1975 when she was President and I was Secretary. The skating world has lost a wonderful person. So sorry to hear of Jan’s passing. My thoughts and prayers are with you during this difficult time. My sincere sympathy on the passing of Jan. I have many memories of her in BC and her love of skating will always be remembered. David, my deepest sympathy to you and yours and Jan’s family on her passing… so sorry for your loss. David and family, my thought and prayers are with you during this difficult time – take care! David, some thoughts about Jan from Victoria. I met Jan when the Oak Bay Club was formed and worked with her at many competitions and section activities. She was a tireless worker and always had a smile and a good word for everyone. We had some great trips to CFSA annual meetings and I will always remember the fun that we had. My condolences to you, Julie, Jamie and all the family, she certainly was one of a kind. David and family, so sorry for your loss. Jan was such a great lady and was a huge part of my skating years with Queens County Blades. From the dresses to the dances she was always a helping hand and will be forever missed. Dear David: We know how hard you worked and made plans for retirement together, and we also realize that many, exceptionally difficult changes to these plans will now have to be made. The ability to move forward and to heal will happen as time passes. We wish to extend to you and your family, our most sincere condolences. To all the family, our thoughts are with you at this very sad time, god bless her and all of you . To David and family. My sincerest sympathy to you and your family on the passing of Jan. A wonderful, cheery and energetic person with a smile and greeting for all. Jan and I roomed together whenever we were away at competition or AGM’s while we were both on the Skate Canada BC Section Board. My heart goes out to all her family as she was a great lady and will be missed by all. My absolute sincere condolences to the family on Jan’s passing. Even though we had lost touch over the many years, I will always remember the amazing love and devotion she gave to skating in Victoria at the Oak Bay Figure Skating Club. Her heart was forever large and giving. This will remain for sure. It was with great sadness that I have learned of her passing. I send you all my love and heartfelt wishes as you pass through this very challenging time. ps I know that my mother, 96, who was a good friend of her mother would also love to send her wishes as well. Please accept my deepest sympathies, David & family. I was saddened to hear of your loss. May God keep you safe & comfort you in this difficult time. I was so shocked to see your mom has passed away. I lived two doors down from you on Sutherland Rd. and you were like a second family to me. Your mom was a very good mother and I took after her when i had my own babies. I would love to hear from you if you ever want to chat.